In Notorious Match, the hero uncovers the truth behind the carriage wreck that killed the Earl of Northam and his wife. See this post for further detail. Diana shook her head at the pity in Griffin’s expression. Griffin stepped forward and cradled her face in his hands, his shoulders strangely hunched up as if she were something fragile. Griffin remained silent, inviting her to continue. Suicide deaths were condemned right through the Regency. Diana’s uncle, the Marquess Wimberley, did everything possible to shield the truth of his older’s brother’s death from the ton. To avoid the horror of the ignominous burial. 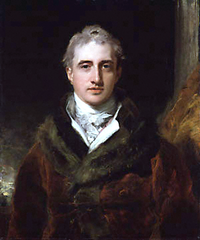 Case in point: Marquess of Londonderry, 1822. Robert Stewart served as Chief Secretary for Ireland and was known as Viscount Castleraugh for most of his life before succeeding to his father’s title as marquess. He was a force to be reckoned with in British politics. The Napoleonic Wars required extraordinary skill in diplomacy and his lordship provided ample support as a member of the Ministry of all the Talents (yes, that was a real ministry). See an earlier post on the matter. He was Lord Secretary of Ireland, securing union with that land to prevent it from becoming a French satellite as Scotland had been three hundred years before. He became Secretary of State of War and the Colonies and later Foreign Secretary, an illustrious diplomatic career that culminated in the Congress of Vienna. The marquess had the unfortunate destiny of being reviled for effecting decisive policies for the kingdom. It is a fate which no politician, even to this day, can escape. In any case, his sovereign, George IV, was so alarmed at his condition His Majesty took it upon himself to notify Stewart’s doctor. It was too late. Robert Stewart used a penknife, left forgotten in a desk drawer, to slit his throat. It was a terrible scandal. Were the marquess declared a suicide, he would have commited a felo de se, or crime against the self. It was an old common law offense that bedevilled prosecution until a more horrible penance could be devised–one that was extracted from the survivors. The body of a suicide was denied burial in consecrated ground. Worse, it would be consigned to an ignominious burial in a highway crossroads where all manner of cartage and transport may occur over the body. A demeaning location of anonymity where the remains would suffer the indignity of offal and every kind of refuse, to be trampled and mingled with the earth that held the body of a person once kissed, caressed and held. Worse, the decedent’s body would be staked through the heart. Presumably to prevent removal by the family. Posterity will ne’er surveyA nobler grave than this:Here lie the bones of Castlereagh:Stop, traveller, and piss. And you thought you knew Shelley, Byron and Stoker. Lady Castleraugh was desperate–enough to have her husband declared insane. Without intent, as the requirement of common law demands, a suicide had not occurred. And his lordship could be given a proper burial. Today you can see his lordship’s grave near his mentor, William Pitt, at Westminster Abbey–the graveyard of England’s greatest. This entry was posted in Regency, Uncategorized and tagged Amelia Emily Hobart, byron, George IV, Marquess Londonderry, Robert Steward, Shelley, Stoker, Viscount Castleraugh, William Pitt by Angelyn. Bookmark the permalink. I knew about burial at the crossroads for suicide deaths. The other details are interesting. I always assumed it was because the crossroads were “crosses”. Good subject for Halloween and All Saints Day! I had heard that as well about the crossroads being a symbol of the cross. Thinking of it from Emily’s standpoint, and indeed, the family’s feelings about the ignominious burial–one would be horrified on so many levels at the thought your loved one’s body would suffer so much indignity and that absolutely nothing could be done about it. Thinking about the stake through the heart: I’m inclined to view this less as a superstitious practice and rather more as a punishment that falls on the family knowing the decedent’s body had been deliberately mutiliated. Presumably this would serve as a deterrent to future would-be suicides knowing the additional agony that would be heaped upon those left behind. This is sad and horrible and a bit creepy all at the same time. My heart goes out to his wife and the rest of his family! It has the distinct potential for it’s own gothic love story! One that I could so see you writing – Hmmmm?? I knew about the crossroads burial, but I’d heard it was to make the ghost confused as to which way to go. Didn’t know it was to further desecrate the body. Sounds unusually cruel to the family, doesn’t it? I think perhaps that by the time of the nineteenth century, the horror of what awaits the suicide in the afterlife had worn off. Yet the links one maintains with the living remain and that was the sentiment the penal code sought to harness in effecting its punishment.